How do you like that? Dorie called me out in the very first sentence of her introduction to this week’s French Fridays with Dorie recipe, Citrus-Berry Terrine (recipe published here if you would like to take a look). I have hated jello ever since I had my wisdom teeth pulled and could basically eat nothing but for the better part of a week. In fact, I wonder if that has something to do with the general American dislike for jello, isn’t it hospital food? Well, whatever the cause, I have long been in the ”snobby at the mere mention of gelatine” camp. Needless to say, there is not a chance I would have tried this recipe had I not been participating in this project. But try it I did. After all, the local berries are currently at their sweet juicy best and we have been buying them like mad, so why not try something new with them. However, knowing that I would never be able to sell this to my husband as a dessert, I planned to serve it for breakfast, I mean it’s basically berries & grapefruit juice so breakfast is hardly a leap. And do you know what? I actually liked it! I wouldn’t go so far as to say that I loved it, but with this recipe Dorie has convinced me to set aside my snootiness and give gelatine a chance. In fact, I think this would be a great recipe for those occasions when you have a crowd over for breakfast. This entry was posted in french fridays with dorie and tagged Around my French Table, dessert, pudding, seasonal - summer. Bookmark the permalink. I love your idea of serving this for breakfast – with a dollop of yoghurt perhaps? Hang in there – the summer is surely coming soon, right? You know, I thought about serving this with yogurt, or even cream, but I just wasn’t sure the two textures would go together. I’d love to hear if anyone else tried it. Now this is a dessert I could easily have for breakfast, it’s packed with so much fresh fruits! So glad you actually ended up liking it, so the effort to make it wasn’t a total waste after all. I ate leftovers for breakfast yesterday, and probably will again today. It works perfectly as a breakfast! I’m glad you enjoyed this one. I know I was surprised by how good it was. I think its all the obnoxious Jell-o dishes that were thrust at us during childhood that turned Americans off to gelatin. Shiver. However, this one did make me willing to stick my toe in the world of gelatin! I agree with your assessment that jello is hospital food and probably why most of us have an aversion to it. Love that you served your terrine for breakfast…perfect! So happy you enjoyed it. If you think about the proportion, there is hardly any gelled juice. Just enough to hold the fruit together into a loaf. I totally agree that it is great for breakfast. Next time I’ll replace more orange juice with champagne for a mimosa since we’re already thinking brunch! Champagne sounds like a great idea! I’m thinking breakfast/brunch is definitely where this recipe fits best. I love the look of your sliced berries through the terrine, especially the blueberries! I am so glad that you tried it and liked it! Your slices of terrine look so pretty! I agree that it would be perfect to serve to guests. Have a wonderful weekend! I also served it for breakfast…and we loved it! It was hot and humid and the terrine was cool and refreshing. Glad you enjoyed it! Your terrine looks lovely! Enjoy your weekend! Hadn’t thought of serving it for breakfast but I like the idea! Gelatin totally intimdates me…it’s right up there with a pressure cooker! But i am inspired to learn how to use it, especially if I can incorporate it into breakfast! Thanks for stopping by. I definitely agree with the pressure cooker, I don’t own one and have never tried using one, they look pretty scary. Gelatin, however, wasn’t that bad! You should definitely give it a try. I had these as a very early morning snack before working out all last week. I don’t think that will be the case if I decide to try the inspired sparkling wine addition from the comments! 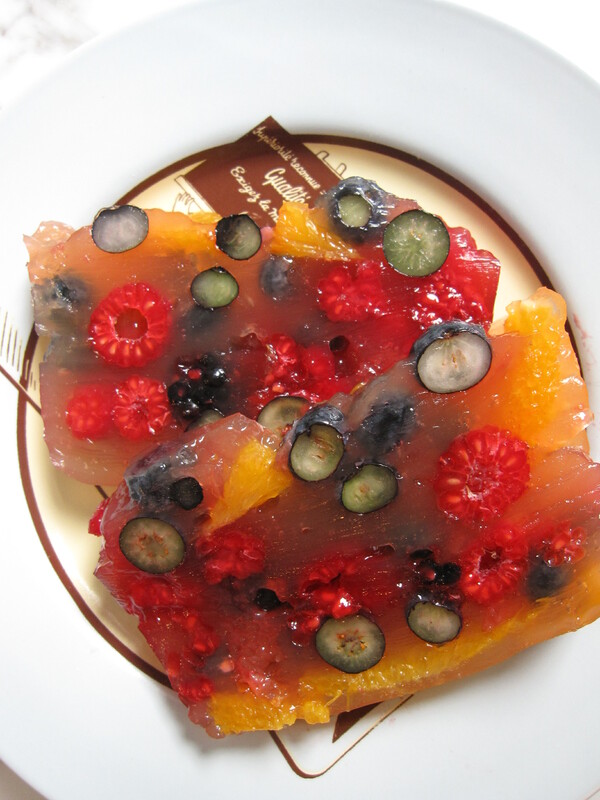 LOL – I was with you, the gelatine was worth a chance, but tasted just OK. It looks pretty though!